Patients with an unusual complex of congenital developmental abnormalities, such as aniridia (see the image below), genitourinary (GU) malformations, and mental retardation, are at high risk (>30%) of having a Wilms tumor. At birth, the association is aniridia, GU malformations, and mental retardation (AGR) syndrome. With the discovery of a Wilms tumor in these patients, the association is referred to as WAGR syndrome. These syndromes result from the loss of chromosomal material from the short arm of chromosome 11. Aniridia. Note the almost complete absence of the iris. 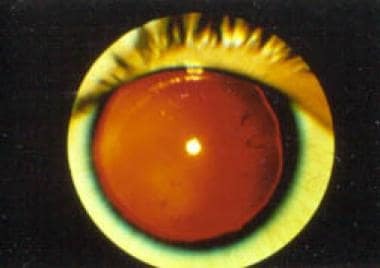 Aniridia, GU malformations, and mental retardation are usually detected in the perinatal period, and patients with these conditions require careful long-term follow-up, both because of the consequences of the congenital defects and because of the potential development of a Wilms tumor. Early tumor detection has improved the long-term disease-free survival of children with WAGR syndrome. See Wilms Tumor: A Pediatric Oncology Success Story, a Critical Images slideshow, to help identify the clinical features, staging evaluation, prognostic factors, and therapeutic options for this tumor. WAGR syndrome affects the development of seemingly disparate areas of the body, including the kidney, the GU system, the iris of the eye, and the CNS. The deletion of varying lengths of chromosomal material along the short arm of chromosome 11 is the underlying defect, and developmental abnormalities are related to the contiguous loss of neighboring genes. The brain-derived neurotrophic factor (BDNF) gene is also located in the region of chromosomal loss associated with WAGR syndrome. Loss of function of the BDNF gene in some patients with WAGR syndrome may produce obesity and hyperphagia. [4, 5] See the image below. Subjects were categorized as BDNF haploinsufficient by comparative genomic hybridization. Subject A has a large deletion on chromosome 11 that removes one copy of the BDNF gene. Subject B has a smaller deletion that does not remove BDNF. The incidence of WAGR syndrome has not been determined. Wilms tumor occurs in approximately 8 per 1 million white children in the United States; the incidence is somewhat higher in blacks. Only 2% of patients with Wilms tumor have an associated genetic disorder. In a US study of 3442 patients with Wilms tumor, only 26 (0.76%) presented with aniridia. Wilms tumor occurs in more than 30% of patients with 11p13 deletions. In stage I, the disease is localized to the kidney. In stage II, the disease extends through the capsule of the kidney. In stage III, the disease extends to ipsilateral structures or beyond the line connecting the poles. In stage IV, the distinct metastases are present. In stage V, bilateral kidney involvement is present. In the third National Wilms Tumor Study (NWTS), the survival rate ranged from 95% for stage I to almost 80% for stage IV. Patients with stage V tumors, some of whom had WAGR syndrome, had an overall survival rate of approximately 87%. Aniridia results in decreased visual acuity, although the amount of vision loss varies. Aniridia has been associated with the development of glaucoma, probably due to the structural abnormalities of the anterior chamber of the eye. Cataracts have also been reported in these patients. Over time, scanning nystagmus develops in infants who are visually impaired. Other ocular abnormalities seen in these patients include corneal pannus and optic nerve hypoplasia. A wide variety of GU abnormalities are associated with WAGR syndrome; these include cryptorchidism, hypospadias, and renal and ureteral malformations. Streak ovaries and bicornuate uterus have been reported in females with AGR syndrome. The presence of pseudohermaphroditism should alert the clinician to the possibility of Denys-Drash syndrome, a distinct diagnosis resulting from constitutional WT1 mutations. The cognitive function of patients with WAGR syndrome widely varies. The appearance of retardation is correlated with the amount and position of genetic material lost from chromosome 11. Cognitive testing must be performed carefully and is more difficult to evaluate in children with vision loss. Wilms tumor occurs in approximately 8 per 1 million white children in the United States; the incidence is somewhat higher in blacks. Aniridia and/or GU abnormalities are usually detected while the baby is in the newborn nursery, and the diagnosis of AGR syndrome is considered at that time. Al-Hussain T, Ali A, Akhtar M. Wilms tumor: an update. Adv Anat Pathol. 2014 May. 21 (3):166-73. [Medline]. Yamamoto T, Togawa M, Shimada S, Sangu N, Shimojima K, Okamoto N. Narrowing of the responsible region for severe developmental delay and autistic behaviors in WAGR syndrome down to 1.6 Mb including PAX6, WT1, and PRRG4. Am J Med Genet A. 2014 Mar. 164A (3):634-8. [Medline]. Han JC, Thurm A, Golden Williams C, et al. Association of brain-derived neurotrophic factor (BDNF) haploinsufficiency with lower adaptive behaviour and reduced cognitive functioning in WAGR/11p13 deletion syndrome. Cortex. 2013 Feb 19. [Medline]. [Full Text]. Han JC, Liu QR, Jones M, et al. Brain-derived neurotrophic factor and obesity in the WAGR syndrome. N Engl J Med. Aug 2008. 359:918-927. [Medline]. Rodriguez-Lopez R, Perez JM, Balsera AM, et al. The modifier effect of the BDNF gene in the phenotype of the WAGRO syndrome. Gene. 2013 Mar 10. 516(2):285-90. [Medline]. D'Angio GJ, Breslow N, Beckwith JB, et al. Treatment of Wilms' tumor. Results of the Third National Wilms' Tumor Study. Cancer. 1989 Jul 15. 64(2):349-60. [Medline]. Tezcan B, Rich P, Bhide A. Prenatal Diagnosis of WAGR Syndrome. Case Rep Obstet Gynecol. 2015. 2015:928585. [Medline]. Breslow N, Olshan A Beckwith JB. Epidemiology of Wilms tumor. Med Ped Oncol. 1993. 21:172-181. Robinson DO, Howarth RJ, Williamson KA, van Hyningen V, Beal SJ, Crolla JA. Genetic analysis of chromosome 11p13 and the PAX6 gene in a series of 125 cases referred with aniridia. Am J Med Genet A. Mar 2008. 164A:558-569. [Medline]. Termine C, Parigi G, Rossi M, Romano P, Balotin U. WAGR syndrome: is the 'R' always justified?. Clin Dysmorphol. Jan 2007. 16:69-70. [Medline]. Knudson AG, Strong LC. Mutation and cancer: a model for Wilms tumor of the kidney. J Natl Cancer Inst. Feb 1972. 48:313-324. Call KM, Glaser T, Ito CY. Isolation and characterization of a zinc finger polypeptide gene at the human chromosome 11 Wilms tumor locus. Cell. Feb 1990. 60:509-520. Ton CCT, Hirvonen H, Miwa H. Positional cloning and characterization of a paired box- and homeobox-containing gene from the aniridia region. Cell. 1991. 67:1059-1074. Haber DA, Oshn RL, Buckler AJ. Alternative splicing and alternative structure of the Wilms tumor gene WT1. Proc Natl Acad Sci USA. 1991. 88:9618-9622. Hamilton TE, Ritchey ML, Haase GM,et al. The management of synchronous bilateral wilms tumor: a report from the national wilms tumor study group. Ann Surg. 2011 May. 253(5):1004-10. [Medline]. Takada Y, Sakai Y, Matsushita Y, Ohkubo K, Koga Y, Akamine S, et al. Sustained endocrine profiles of a girl with WAGR syndrome. BMC Med Genet. 2017 Oct 23. 18 (1):117. [Medline]. Beckwith JB. Precursor lesions of Wilms tumor: clinical and biological impications. Med Pediatr Oncol. 1993. 21:158-168. Fischbach BV, Trout KL, Lewis J. WAGR syndrome: A clinical review of 54 cases. Pediatrics. Oct 2005. 116:984-988. Dahan K, Kamal M, Noel LH, et al. Small glomeruli in WAGR syndrome (Wilms tumor, aniridia, genitourinary anomalies and mental retardation) syndrome. Am J Kidney Dis. June 2007. 49:522-527.